Artists are courageous beings. They begin with a blank slate – a sheet of music, an empty canvas, a block of marble, a slab of clay, an empty stage. There is nothing but the desire to follow the impulse to express itself to itself. Humans, each and every one of us, are after all courageous beings – we are always and everywhere artists. We approach each day as if we know what will be created and experienced. The truth is we never know. We live into a pretending, and even in that we are creating a work of art. This art form – the pretending, assuages our fears and insecurities, until they don’t. The question that arises for me is this: What is the source of my creativity and my creations – is it fear, or is it a natural unfolding that is irresistible and inextinguishable? Some of you may have noticed that I hadn’t contributed to Orcas Issues for a few weeks in August. Something came up. Something I wasn’t able to manage quickly and effectively. I believe this process – the something came up process, is part of every person/artist’s life; and yet I never get used to it, and I never like it. Actually, I hate it, even though inevitably the outcome is hugely valuable to my mind, spirit, and emotional self. It’s my ego-self that rallies against the resistance, and to a large degree it is the ego-self that created the resistance in the first place. We are complicated beings, indeed! What I write usually begins with a spark of an idea – an impulse that desires expression. This spark gets incubated over a number of days. I feel into it, taking it personally, while questioning the universality of the idea – is it universal to human beings in general – or just based on my perceptions? Through this process I’m always stirred at an emotional level, which more often than not creates degrees of discomfort that I don’t like being with. It’s part of the creative process – to stretch our comfort zones to include greater capacity for seeing and knowing oneself and one’s reality. Truth is, creativity is just the unfolding expression of the Universe – that’s what the Universe does – It is creator, creative, and that which is created! Some call this God. When I’m trying to get something from my creativity, now, the impulse to create is affected by fear, and the impulse to create begins to wane. Like any relationship where demands are placed on what is natural and effortless, the impulse to shrug off the demands interferes with the natural unfolding, perhaps bringing everything to a halt! Artist Block! I believe that regardless of the context – endeavors of art or endeavors of humanness, every human being questions the degree to which their activities satisfy and fulfill their spirit. That we question is, I believe, a spiritual quest-ion. Few of us perhaps can change our circumstances, and even fewer have the consciousness to change their inner reality; most accept their circumstances and live out their lives suffering, settling and surviving, as best they can. A dear friend of mine survived not only stage 4 throat cancer, but he survived radiation and chemotherapy. Interestingly enough, a fellow down in LA called me this week; he too survived stage 4 throat cancer, radiation and chemo. Both men were stirred and affected by all the myriad of trials of going through such a horrendous process. Both found they had been significantly changed by the life threatening process of saving their lives. Both found that the lives they had been living no longer satisfied and nourished their wellbeing. Cancer required them to face insurmountable fear, and as newly realized artists of their hearts they now want to create their futures not by pretending to be artists but by courageously facing the blank canvas of what is, not what they hoped would be. As artists, we can do that which comes easy to us – over and over again – it looks good, and it proves that we are good enough. Or we can keep stretching our abilities, our vision, our orientation, our willingness to express the essential nature of our being, regardless of what it looks like. I don’t yet have answers to my questions – why do I write, why do I create? Sometimes these questions are just mind games, which only create fear, resistance, and interference with the natural impulse to create one’s heart’s desire. My experience is – and I believe this to be an absolute and Universal truth, that if we ignore the thoughts of fear and the discomfort that arises with those thoughts of fear, each one of us will effortlessly follow the impulse to create beauty in all its expressions. Every artist I know faces the impulse to listen to those fearful thoughts. Those who fail to sing, dance, write, paint, play to their heart’s content, are those who aren’t quite ready yet, but they – we, are getting closer and closer every minute of our lives! To me, it can’t be any other way, because to be human is to be a creative – yes – a creative. John is a Guru – not that he would recognize himself as one. He is in his mid 80’s, retired, and lives with his wife Eleanor. When looking at John, you wouldn’t notice anything special about him, other than he is very tall, and when he smiles he lights up the room. He doesn’t talk the spiritual talk, nor would he consider himself to be walking a path of spirituality. Yet, I find that when I’m around John, I’m relaxed, peaceful, and I’m not inclined to do anything other than just sit in his presence. Hendrick is another Guru. There is a different quality of presence in Hendrick than in John, but the delight I feel when I’m in his presence is palpable. More and more I find within myself a greater capacity to recognize the gurus among us. They are just human beings living one day at a time, experiencing life issues the same as everyone else. Guru’s are like that. They are normal men, women, and children, and though they may have abilities to experience love and light beyond what most of us experience, their greatest gift is that, in their presence, people experience peace within themselves. In their presence, people enjoy being. Can I Enjoy Being Me? When Do You Enjoy Being You? You can’t imagine the looks I get when I ask this question. It’s as if the screen on one’s computer just went blue – and then the reboot begins. They will say: “What do you mean, when do I enjoy myself?” Or, “Well, I’m not sure how to answer that question.” They are stalling while they get a handle on what I’m asking. I get it. Few of us are comfortable knowing who we are inside our skin – and what is true for us – inside our skins. I, like so many people, initially found it unnatural to think or to know when I was enjoying myself, until my own therapist, many years ago, turned me in the direction of when, where, and with whom I enjoyed being me. My life then was primarily made up of relationships within which I thought I was supposed to be okay in. I worked hard to like and love people who didn’t like or love me, nor had the capacity to love or like me, or themselves for that matter. I exhausted myself trying to be one who would be loved by everyone – especially by my mom and dad, sisters and brothers, husband and children. Truth is, no matter what, I rarely enjoyed being with them. Get it? I didn’t enjoy being me – with them. But, because I was supposed to enjoy being with them, I figured there was something wrong with me, and I would never have what it takes to be happy, content, or fulfilled in any relationship. However…. I realized that there were times, people, places, and activities within which I thoroughly enjoy being me. Initially I made that wrong. But over decades, I’ve enjoyed being me as I am, wherever I am, even though I still sometimes judge myself, because my life looks different, quirky – anything but normal. I was trained to not like my life as it is; I’m supposed to be striving for better, different, more! But I’m giving up striving for better, different, more, and now only strive for simple acceptance of me as I am – no matter what. As I strive for simple acceptance of me, I meet the most amazing people who are everyday gurus, everyday men, women, and children, who somehow, magically it seems, light me up, just by being themselves. I feel the warm embrace of connection, not by some special individual sitting cross-legged on a pillow, chanting OM. No, these gurus are the clerks at the grocery store, the patrons at the Center – purchasing tickets for the upcoming performance, & friends around the kitchen table – sharing a meal and a game of cards. In these environments, with these people, which now seems like everywhere, I enjoy being, and I enjoy being me. The upside of aging is that, as long as we are alive in these bodies, we are provided with opportunities to discover and embrace the being within. And, as we accept and enjoy the truth of this being within, more and more often those Gurus magically show up in our lives, and we feel blessed, delighted, and enjoy just being. If you’d like to join Dr. Rosie in the AGING – Who Me in-person discussions at the Orcas Island Senior Center, they are meeting this coming Tuesday – Aug. 8th, from 10 – 11:30 a.m. When I think about the millions of people who are in their 60’s, 70’s, 80’s, and 90’s, I wonder what brings fulfillment to their lives. As they disengage from the external world, by choice or by circumstance, most will question reality, much like Scarlett, Martin and Thomas do. Scarlett is not unusual. Those who are aging – like all of us – transition through stages of life from those times when everything makes sense & means something to those other times when nothing matters, . . . and who cares anyway? What we think of as a mid-life crisis – what occurs in the 40’s and 50’s, are founded on the shattering of the illusion of – what is significant should remain significant, and, what you want to be significant, isn’t. We’ve been trained to believe in THE REALITY, and all of a sudden it isn’t. The opportunity to question reality and ask – What’s the point – confronts the world around us and the world within. This moment can be a huge game-changer for many individuals. And it is happening at all stages of aging – there is no longer that demarcation of when mid-life begins or ends. Thomas asks: “Who came up with the concept of THE GOLDEN YEARS? What a crock of S**T!” Thomas is finding that what used to be significant and important in his life, like his favorite NBA team, or money, or . . . just isn’t important any more. He used to look forward to being retired and to all the freedom that would give him. But now that he’s retired, Thomas knows that it isn’t apathy he is feeling. It’s just that, what was significant to him in the past really doesn’t matter any more. So now what? These aren’t rhetorical question. Someone inside you – regardless of age – is asking the questions, because you want to get to know who is having the experience of aging, of transitioning through various aspects of life. Who is having the direct experience as you, as the being within the experience? Most of us are terrified to reflect on these questions. We avoid the emotionality that resides within. Nonetheless, I believe that in the midst of the experience of meaninglessness is an opportunity to step into the true rich experience of this – this exploration that is as meaningful and fulfilling as any other in the world. Quite a few studies indicates that people die after retiring and after the death of a spouse or partner – it’s called the widowhood effect. Our work, partners and families bring meaning and fulfillment to our lives, or at least they are supposed to. It’s where we create a sense of identity, meaning, and purpose. When we stop working, when our partners die, when families are less involved, people are more likely to give up and die. “What’s the point of going on?” asks Martin. Later phases of life, within which one may experience meaninglessness, purposelessness, feeling insignificant or valueless, doesn’t have to automatically equate to depression, medication, isolation and death at an earlier age. These phases provide opportunities to have deep and important conversations with yourself. These conversations allow each of us to make sense of our reality – the one we are currently in – in relation to our expectations of this current reality. These conversations are meaningful and purposeful, especially when the intention is to discover and reclaim the vibrancy of the living energy-being that you are – always! The intention of these aging articles is to cultivate curiosity and consciousness about who you are within, as you live in two worlds at once: the external world and the internal world. Creating dialogs with yourself can be challenging, and you may want to consider giving yourself some sessions with an individual who can support and companion you through this process of living with aging and change. There is wisdom in sharing yourself with those who know the path and the journey of humanness. You are not alone. If you’d like to join Dr. Rosie in the AGING-Who Me in-person discussions at the Orcas Island Senior Center, they are meeting this coming Tuesday, Aug 8th, from 10 – 11:30 a.m.
About 8 years ago, some friends of mine, Harvey and Kate, while sitting at a stoplight in their cute little sports car, having a beautiful peaceful day off Island, were struck from behind by a big truck. It crushed the easy-going brilliant life that they knew was theirs. Physical injury and trauma to the brain completely changed their orientation to life. The degree to which they have recovered allows a great deal of mobility and possibilities, however, everyday they live with the consequences of their life choices: They live with chronic pain and an inability to rely on their mental capabilities; they live with their choice to buy a little sports car, drive off Island that fateful day, and choose within every moment of life how they will face the unknown that arises every day. For decades, my friend Marvin worked for the airlines until he retired. Every day, as he loaded and unloaded baggage from airplanes, he was exposed to the sound of those jet engines that can blind a person with sound. Marvin suffers with major hearing loss because of his choice of jobs. He too, like Francis, Harvey and Kate, at times, questions the choices he made and the consequence of those choices. Personally, I’ve yet to be affected by the 3 D’s of aging – Decline, Depletion and Deterioration – like Frances, nor have I been affected by other life circumstance such as Marvin, Harvey and Kate, that could not be anything other than annihilating to one’s frame of reference. I also have all my faculties: the ones that we all rely on to navigate reality and which we believe allow us relationship with the world & communities within which we exist: sight, hearing, mobility, & mental faculties. I didn’t go to war, where one loses limbs, friends, and too often peace of mind. I did however choose marriage, parenthood, divorce and separation from my children. To choose this and not something else required me to deal with the ravages of the death of innocence, and the loss of hope that love will prevail. Life’s battles, regardless of how mundane they appear to be, require each of us to accept what is, which can be as horrendous and traumatic as anything imaginable. I don’t know of a single person who has lived a life free of some form of trauma due to choices they have made, or that were made by others. Each of us are left to our own devices to be with the consequences of those unforeseen, undesired events. Essentially, we either choose to frame our reality in the perspective of victimhood, or we choose to see the bigger picture – one that lies beyond powerlessness, hopelessness and helplessness. Truly, no one likes this particular conversation I’m having with you through this writing, even though it circles around in our mental conversations continuously. We experience the hardships of our circumstances, while at the same time we courageously muster the strength to live within the consequences of life’s undoing. It seems impossible and unrealistic to even attempt to shift our frame of reference from seeing ourselves as victims of decline, deterioration and depletion of life force, to a perspective which provides opportunities to experience who we are as our essential selves, within these difficult and undesired experience. It is because of those unanticipated, unwanted, despicable life circumstance that I’ve come to experience who I am in the truest sense. If I hadn’t been forced into certain circumstances that stretched my capacity to question reality, question faith, question truth, I wouldn’t have grown my ability to even experience serenity. I couldn’t have experienced first hand how grace works in such profound ways. I wouldn’t have developed the tools to empower others to find their ways to serenity through grace. Truth is, most of us live with our circumstances, frustrated, disappointed, angry and sometimes hateful. We don’t have a way of seeing it any other way. So we avoid and distract ourselves from our agony and our fears, hoping that someday there will be ease, grace and serenity. I believe that whatever circumstance we currently sit in, regardless of age, race, religion, gender, sexual preference, or political orientation, we each reach a moment where we examine who we are within our life choices, our life circumstance. We rail and flail against forces that have brought us to this moment. We resist grieving the loss of the world we once knew, experienced, and hoped would always be. We hate those who ignore our plight, those who won’t even try to accept us as we are now, with all of our failings and faults. We feel marginalized, isolated, cast out, useless, without purpose, and most importantly, without a true knowing of Self that guides and companions each of us through life’s unfolding. At some point, each individual comes to a choice point, where they can choose to surrender all of that – all the suffering created by using the compass of discontent. It is an opportunity to admit we are powerless, perhaps even helpless, and our situation is hopeless. None of us truly look forward to this moment of choice. Few of us actually choose a path of acceptance, and fully allow the joy that is accessible through acceptance. This isn’t heartbreaking news, because everyone of us has the ability to choose the life worth living. Except for a very few, everyone of us has the ability to let go of what no longer serves a life of serenity. I smile as I write this, because I know that the possibility for each of us to create that joy is so very near. If you’d like to join Dr. Rosie in the AGING – Who Me in-person discussions at the Orcas Island Senior Center, they are meeting this coming Tuesday – July 25th, from 10 – 11:30 a.m. Dying – The Final Big Adventure! We die a thousand deaths within one lifetime. We experience ourselves in untold numbers of transitions. We face the unknown at every stage of life, and it appears as though most of us have survived. There is the deconstruction of our childhood as we immerse ourselves into puberty and adolescence; we leave behind adolescence when we choose careers, marriage, families – arenas of life where we grow our willingness to be accountable for our words and our actions. The death of innocence occurs over and over again, as reality shows us the ugly, the horrific, and all that has us question our sanity. Each of these crossroads bring us into a process of metamorphose, within which we experience an undeniable transformation. The past becomes irrelevant. The future cannot yet be imagined. In this moment, we stand naked and free, strong and willing to fly. Carolyn is transitioning. Vitality and vigor to fight her stage 4 cancer were the sword and shield she wielded. She had apparently been winning the battle for the past 2 years, but something shifted, and she has gone from seeing herself as unstoppable and unbeatable to an individual who hasn’t the energy to walk, talk or eat. She has transformed herself from everyone’s champion to a frail human being, with the inability to even desire to do what it would take to be who she was just weeks ago. Carolyn is at the edge of her final frontier, experiencing the adventure of being Carolyn through this stage of life – her last stage. My heart aches as I write this, because for me, this moment in Carolyn’s life is truly one of the most rich and poignant she will ever have an opportunity to experience. She could very well miss the achingly beautiful truth of who she is within this now fragile human form. In our discussion group at the Senior Center, when the discussion of dying comes up, it is mostly regarding fear of the process being a painful one, with a lot of suffering. We anticipate the worst while we hope for the best. We spend countless hours and untold amounts of energy thinking about, imagining and worrying about the potential worse case scenarios of the end stages of life. Many would deny this to be the case, however, even Freud said that the fear of death influences us more than any other, even if it is on a sub-conscious level. Most of us ignore our dying process as much as we ignore our aging process. We don’t want to think about it, because it stresses us out! My friend, Shahiri, who has been at the side of many people as they transition from life to death, says that most people do the majority of their spiritual development in the last two weeks of their life. Why is this, you might ask? Because the inevitability of truth that is being experienced directly can no longer be denied. When Carolyn received the prognosis from her oncologist, that there wasn’t anything more they could do for her, she went home to be alone with herself. She isolated herself from her husband and her son. I imagined that she faced, for perhaps the first time, true defeat. And, with that, for any warrior, comes great humiliation and shame, because she failed to beat her cancer, she failed to beat death. I imagined that she also experienced guilt and self-hatred for abandoning her husband and son. Dying is a humbling experience, one that releases us from who we think we are, who we think we should be, and allows us to be fully open to who we are as our Divine, essential nature. Dying is the process of transitioning out of this bodily form. For most people, it isn’t death that is so frightening but this process of calmly dying, surrendering the fight, releasing the baggage that we have to leave behind, and heading out on another big adventure. Everyone of us has a ticket for this grand experience. How we engage with this – yet another metamorphose process, is a very intimate and personal experience. What an opportunity to know oneself in a way that has yet to come our way. When the time comes, I hope that I will stay conscious, brave and open – kind of like keeping your eyes open on a roller-coaster ride – I don’t want to miss a moment of it! As a child, my focus of attention was quite often on the future. I anticipated the delight of holidays – Thanksgiving, Christmas, and the 4th of July, to name a few. I anxiously awaited the time when I was old enough to go to church, or begin school – being like the big kids in my family. I longed for my first crush, my first date, my first kiss, and my first, well, you know! I couldn’t wait until I could leave my parents home, go off to college, find a husband, get married and have children. Then with the unhappiness of my marriage, I longed for and anticipated the way out of this marriage. Once out, I anticipated my next big relationship, finishing graduate school, getting a job as a therapist…. So much of my life was lived in anticipation. The others in the room nod their heads, acknowledging John and what he is sharing. Margaret says she has noticed that what used to get her out of bed in the morning – what she anticipated and compelled her to jump out of bed, doesn’t exist anymore. There are fewer and fewer things that excite her enough to leave the comforts of her bed, so she lingers until something gets her up. So in our anticipation of the good and the bad things occurring, we are not attending to who we are and what is occurring in the here and now. Many of us don’t even know how to do this. How many of us carry our cell phones anticipating the next text, email, or Facebook notification. I find this fascinating. I wrote a book about 8 years ago called, The Unholy Path of a Reluctant Adventurer. It is a recalling of my life lived between the life I anticipated and the life I lived. I anticipated my whole life being content as a mom, wife, and just a part of the community on Niagara Falls, Ontario. I never anticipated leaving my children in the custody of their dad, living in Nova Scotia, Canada, crossing the Atlantic Ocean, getting numerous graduate degrees, including a PhD. I also never anticipated writing books, or living on Orcas Island. I never anticipated that I’d be thoroughly enjoying living in a travel trailer for 13 years. I just didn’t see any of this coming! Somewhere between that state of anticipation and the state of being in the present moment, there must be another state of being – perhaps that meta-state I spoke about in the previous article “Game Changers – They Happen When Least Expected.” But in this state that appears to be between anticipation and living in the now, life is unfolding – I believe it is the road less traveled. It is available to us all, but few willingly explore such territory. As we age, I believe we have more access to this state of being. With less stamina and energy, we begin to be more selective of what we wish to bring into our lives. As we age, most people say they want more peace and less angst; so they choose accordingly. The anticipation of just opening their eyes and seeing the light of day can bring as much excitement as a child anticipating Christmas. It is a challenging practice to anticipate the now, however I believe that aging provides us with the wisdom to take on this practice effortlessly. If you’d like to join Dr. Rosie in the AGING – Who Me in-person discussions at the Orcas Island Senior Center, they are meeting this coming Tuesday – July 11th, from 10 – 11:30 a.m.
Will I Like This When I’m Done? I’m just coming back to the Island after participating in a Kuhn Sisters’ Week in Michigan. I had a lot of trepidation in setting out to attend this event – will I like this when I’m done? I head out anyway, thinking about it as an adventure, with no expectations. Just go! My four sisters and I love to create art and crafts. So, one part of our time together was Craft Day, when we would all sit around the table making something fun and beautiful. On a hot and humid Michigan day, it creates a time for more personal connections and conversations to emerge. And, the bonus? We each take home a little memento of our time together. The excitement of beginning – the moment a project is started, whether it’s knitting, painting, golf, parenting, or stepping into a new phase of life, you never know what you’ll have in the end. You might like it, you might hate it. The only way you will find out is to just start. My sister Helene and I chose a beautiful shawl pattern, one that my sister Annie finished recently. Neither of us have knitted in a long time, but we dove in, excited about the possibility of loving the outcome. We loved the yarn and pattern, but would we love it when we’re done? Helene, who hasn’t knitted for decades, feels the angst of beginning. “I can’t do it!” she exclaims, even though she hasn’t even tried. 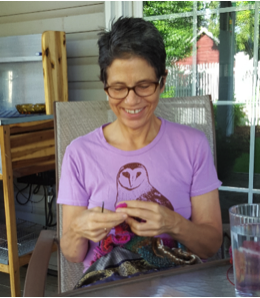 I observe her flitting about the house, being distracted by any number of things, unable to stay in this new practice of knitting. It is only a matter of eight new stitches to learn and implement, row after row, but it is daunting to her nevertheless. I jump in, having Annie as my knitting coach. I feel an ease with the process, and it really helps when I see Annie making the occasional mistake, ripping it out and studying the pattern – it’s the roadmap to her final destination. Like all travelers on any of the myriad of roads of creativity, you have to be willing to see where you are from where you have been. When lost, you go back to where you knew where you knew yourself to be, assess the situation, study the map, and start out again. You might have to return again and again to this point, but it’s very comforting to know that this point exists! As a master at creativity – quilts, paintings, knitting, life, Annie accepts that sometimes, when lost and unsure where she is in the process, she too has to stop. On many occasions, she will rip the piece apart, until she gets to that place where she knows where she is. Sometimes, she just rips it all out and start all over again. She too never knows if she’s going to like her creation, but onward she treads. She says, “If I hate it, I’ll just take it apart and make something different, or I’ll just give it to the Salvation Army.” Lucky Salvation Army, is what I say! Patrice is also an amazing craft person and life voyager. She has a lot of practice embarking on new projects and seeing them through to the end. Less than 10 months ago, Patrice, at 66 years of age, began making a new relationship with her sweetie, David. She isn’t worrying about whether she’s going to like it when she’s done. She is thoroughly engaged in being present and focused on each individual stitch of love she makes, creating a pattern of happiness for her and her beloved. Making relationships as an art form is challenging. Two people are required to bring about the fulfillment of the project. Every day, Patrice and David weave together the threads of their thoughts, feelings, their desires and hopes. The unfolding tapestry is something unique to each and every couple. They do not have a pattern or road map that they are following. In these precious moments, their hearts know the destination. And, right now, they are in complete certainty that they will love it when they are done. Annie texts me on her layover in LAX. “I’m frustrated! I’m not as far home as I want to be!” Impatience is the teacher of humility and acceptance. It’s funny how often we want to get to the end and bypass the hard parts. We want to be in that place where we cruise through life, or our crafts and know with certainty we will like what we’ve created. No one likes the hard parts, except those who are masochists and those who truly know that the wisdom of life and love emerges through being with the hard stuff. There are aspects of life that allow us to live in the hopes that we will like what we’ve created. Facing death as our final project, well, none of us are practiced at dying – we won’t know if we like it until it’s done. We can’t tear out our mistakes and start over. No do-overs! Every part of life, just like every project and hobby we engage in, brings us to these moments where we hope we are going to like it when we are done, but not sure how it’s going to end. We fear for the worst and hope for the best. For each of us, though, there is that certain something that spurs us on to finish what we start. One’s life is no exception. If you’d like to join Dr. Rosie in the AGING – Who Me in-person discussions at the Orcas Island Senior Center, they are meeting this coming Tuesday – July 6th, from 10 – 11:30 a.m. The more years I have under my belt the more I realize the degree to which life is more about change than it is about no-change. That change occurs in the realms of physical, mental, and emotional development; social and political structures; career and finances; relationships with family and community; and last but not least, relationships with ourselves and our spirituality. How could one possibly interpret life as stable with all of the shifts that occur in so many aspects of one’s reality?! In the past, I believed if I earned enough Merit Badges in my life, harm and suffering would remain at bay. I believed that if I think the right thoughts, be charitable, and try to do no harm to myself and others, I’d be allowed to avoid the hairy-scary, life-shattering episodes that no one wants to experience. As I age, more and more often, wisdom sheds light on predicaments and circumstances in ways that allow me to see that to a huge degree, I’m not in control of whether I get sick, whether I’m impoverished financially, whether I am homeless, whether my relationships are all happy and loving, or whether my career path is smooth. I’ve learned to let go of my assumptions and expectations that life is going to go my way, especially if I try really hard to “will” it to be my way. As I age, I find that what I thought life was about is not what life is about. It’s about something else entirely. If you are anything like me, you’ve worked hard to have the right stuff, as in having the right education, the right career, the right spouse and children, the right home, the right 401K, stock portfolio and other investments to ensure you are right where you want to be when you want to be there. I’m exhausted thinking about what it takes to accumulate and manage the accumulation. But, this is what life is about – right? Or, this is what life should be about – right? For some people, it’s about rejecting all of this, fighting for liberty from the evils of stuff. These individuals spend their lives judging and criticizing people who put all their efforts into accumulating stuff. They resist being part of consensus reality, and experience a righteous indignation because they believe they are outside the norm. I’m exhausted thinking about all of the resistance required to attempt to control life. It might be time for a nap! Who are we when we are not accumulating and not resisting accumulation? Who are we when we aren’t fighting to control our weight, our health, our portfolio, our partners and children? Who are we when we relinquish the fight for an identity or role that is deemed important and valued by others? Who are we? As we age, many of us are forced to let go of what we’ve accumulated over our lifetimes: we downsize our careers, our houses, families. We discover that putting effort into anything that isn’t fun is actually exhausting. We become more vigilant about what brings joy. We discover simplicity is much more enjoyable. Sitting outside, watching a tree grow becomes an experience of wonder and delight – an experience that captivates one’s humanness and is soul-fulfilling. When I was in my early 20’s and just beginning to cultivate accumulations – husband, house, stuff, I had a next door neighbor – Reg. Reg was an old, retired Welsh fellow. Most of the time he sat in his backyard for hours every day and watched the seasons change. Reg had an enormous Chestnut Tree in his backyard. Squirrels and birds populated that tree and entertained Reg all day long. He would come out after breakfast, go in for lunch, which his wife Ann had fixed him, then come out in the afternoon until the sun went down. I’d often go and visit ol’ Reg. I felt sorry for him. I thought his life must be boring, and because he had angina, he had to stay relatively quiet. That is how I saw ol’ Reg. One day, Reg’s wife died unexpectedly. Reg still sat outside with his tree. Then one day, because the tree was dying, and branches were beginning to precariously fall on neighbors’ gardens, the tree was cut down and taken away. I experienced it as an amputation of a part of Reg’s being. I believe that losing this tree, this constant companion, was when Reg really began to die. His children sold the house and Reg disappeared from my life forever. Well, sort of. Forty-five years after meeting Reg, he is still very much a part of my life – in fact, I’m a lot like Reg. Where at first I interpreted Reg as being bored and having nothing better to do, I came to see that truly there was nothing better to do. The simplicity of Reg’s world was perfect. Sitting outside, watching the unfolding of Spring, Summer, Fall and Winter brings me huge delight, as it did Reg. The exquisiteness of even one single bird flitting across the yard makes my heart soar. Life is a fascinating process for each individual on the planet. If we are lucky enough to get to the age when we are considered old, we begin to participate in the unfolding process of the being within. We see that there is a ME within that isn’t affected by how much or how little one has; a ME that doesn’t care so much about vanity of any sort – beauty yes, vanity not so much. An evolution of Self is occurring, whether we acknowledge it or not, which, if we are here long enough, inside our human suit, we begin to value that which we’ve been attempting to value all along: Life, as in the acknowledgment and the honoring of the being within all of life – no exceptions. Change is a constant in everyone’s life. Change is what we fear most, because with change comes loss. And, though we so wish to avoid loss and grief, there is no way to avoid the inevitable unfolding of what comes and what goes. I believe as we age, we are gifted with a multitude of opportunities to shift our expectations and arrive in serenity of acceptance and allowance. The adventures of aging are gifts that are given to those who are curious enough to stick around. Curiosity builds courage and resilience, and change becomes the part of life that makes it a great page-turner – you just can’t wait to see what’s gonna happen in the next chapter. If you’d like to join Dr. Rosie in the AGING – Who Me in-person discussions at the Orcas Island Senior Center, they are meeting next on Tuesday – June 27th, from 10 – 11:30 a.m.